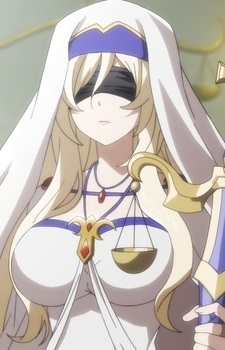 Tsurugi no Otome "Sword Maiden"
Tsurugi no Otome is a former gold-ranked adventurer who currently serves as the Temple of Law's Archbishop of the Supreme God. She is an extremely beautiful woman whose eyes are often covered with a blindfold. Her body is covered in several faint scars that have all mostly healed. Her eyes, which she keeps behind a blindfold, were less so. Tsurugi no Otome is a calm and serene person who doesn't normally get upset with others. However, this masks the depression and anxiety beneath her exterior, as the trauma that was born from her experience as a captive of goblins follows her to this day. It was only thanks to meeting Goblin Slayer that it has lessened. Before she became renown, Tsurugi no Otome was once captured by goblins and tortured mercilessly. Yet, she somehow escaped and later became an adventurer. She made her mark in history ten years ago by defeating the Demon Lord. In particular, she put an end to the machinations of an order known as the Evil Sect. Even ten years later, the group is no closer to summoning their god thanks to her power and influence.